The Senate Finance Committee chair who often clashed with party progressives and populists is quitting. A very different Democrat might replace him. Montana Senator Max Baucus, a Democrat who frequently clashed with his party’s economic populists as the Wall Street–friendly chairman of the Senate Finance Committee, will step down at the end of his current term. Baucus, who will retire from the Senate after thirty-six years, played a critical role in the health-care debate that led to the enactment of the Affordable Care Act. Given substantial responsibility by the White House, the Montana senator declared that “single payer was not an option on the table.” That drew the ire of activists, who charged that Baucus was tipping the balance in favor of the insurance and pharmaceutical industries, and Finance Committee hearings grew so contentious that the chairman ultimately ordered protesting doctors and nurses removed. The senator frequently split with progressive Democrats on critical issues. For instance, he voted to authorize President Bush to attack Iraq and provided high-profile support to President George W. Bush’s tax cuts in 2001. A frequent defender of corporate tax breaks, he was criticized for his tepid response to efforts to crack down on abuses of overseas tax haven. In 2005, he opposed repealing the tax subsidy for US corporations that offshore manufacturing operations. Ultimately, however, it was on the economic issues that critics scoured Baucus upon his announcement that he would step down after this term. “Good bye, Senator K Street,” said PCCC co-founder Stephanie Taylor, referencing the DC base of many special-interest lobbyists. According to a recent New York Times report, at least twenty-eight former Baucus aides have become lobbyists on tax issues that are often addressed by the Finance Committee. Schweitzer, a popular former governor, tops lists of prospective Democratic contenders to replace Baucus. Distinct from the retiring senator in style and on many policy matters, Schweitzer several years ago proposed establishing a single-payer healthcare program in Montana. And he’s been a loud proponent of “Buy American” proposals that aren’t particularly popular with advocates of free trade. Pitched as a 2016 Democratic presidential prospect, Schweitzer acknowledged Tuesday that he is seriously considering the Senate race. He came on the Montana political scene in 2000 as an upstart candidate who narrowly missed unseating Republican senator Conrad Burns. Montana is not much of a swing state in presidential politics, but populist Democrats have run well there in recent years, winning the governor’s office in the past three elections. The race for the Montana Senate seat will be an intense one, however, as control of the chamber will be very much at stake in 2014. 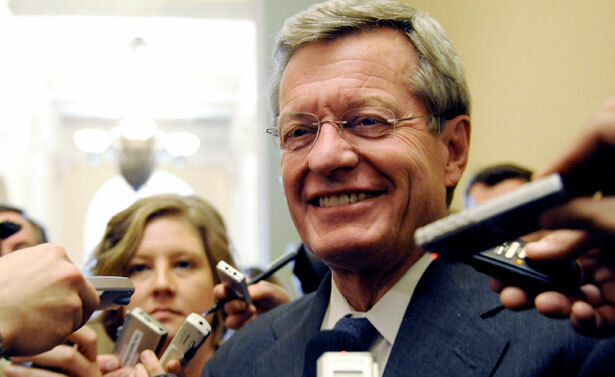 The Democrat Caucus maintains a 55-45 majority in the Senate, but Baucus is the sixth veteran Democrat to announce he’s retiring in 2014. As Tom Tomorrow says, the Senate owns a special place in the failure that was last week.